Create a fragrant aura conducive to open, productive and prosperous relationships. When this elegant card case is opened, the aroma you have selected will rise to greet you and your new acquaintance. 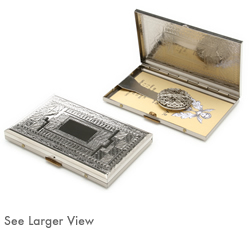 You and your card will be unforgettable, as the scent will lightly linger on cards stored in this case. Initials for card cases will be engraved in the positions of FIRST - MIDDLE - LAST name. To engrave a word up to 7 letters, you will be prompted to enter the first 3 letters - complete word will need to be entered in special instructions area of checkout page.